CEOs and business owners, and every other kind of top leader, suffer losses. Businesses win and businesses lose. Some idea work. Others don’t. It’s easy to gloat over the wins. Maybe it’s easier to get depressed about the losses. It can sure be easy to dwell on the losses and grow angrier at the world. Cynicism runs rampant. Fiction does, too. Last week I talked quite a bit about beliefs and how we can get it wrong. Our wrongness, our losses and all the other garbage that fuels our complaining — it’s time for us (all of us) to own it. Maybe we mostly see what we want to see. The path to Complaintville is smooth, easy and straight. “If only,” are two powerful words most of us use every now and again. They’re stables in the vocabulary of excuse-makers. Our business mirrors the economy. Our business mirrors the industry. There is a Black Swan event. It’s that last one that we don’t like to admit. During my years of running luxury retailing companies I would often hear other people in my space lament everything from the weather, or big events happening in their market, to whether the local team won or lost a game. When you need a reason (a’hem, an excuse), they’re quite handy. As leaders of the enterprise we certainly can impact the outcome. If our company mirrors the economy or our industry, we can directly affect an outcome for the better — or the worse. Your brilliance isn’t always the culprit. I know you’d like the think you’re special in the brains department, and you may be. But not likely. Businesses are full of really smart people who still can’t seem to get it right. Your experience isn’t always the culprit. In the early 70’s I started selling stereo gear. The turntable was the source in every system I sold because customers bought vinyl records. It was our only music source. If you wanted to convert the music to tape you had to purchase a reel-to-reel recorder. That was before 8 tracks and cassettes arrived. My experience in selling turntables stopped serving me when vinyl bit the dust. I could have done what I see some business owners and CEOs do — they fell in love with earlier experiences and now they’re too romantic about it. You see it (well, I mostly hear it) whenever they begin to talk about the good old days when things were different. Sometimes nostalgia can morph quickly into complaining. Those of us involved in business or organizational pursuits – leaders of companies and other enterprises – recognize that we’re not all created equally. Our skills differ. Our personalities do, too. And our opportunities vary just like our connections, how our parents raised us and how we see the world. Heredity, environment and natural aptitude – they all matter in business careers just like they do anything else. It’s wildly popular. Well, the notion of it is highly popular. The true meaning is taking financial responsibility for the outcome. It’s what we do running our businesses. That whole “taking responsibility” can be tough though. And painful when things aren’t going well. We enjoy getting the credit for a win. We also enjoy finding an excuse when we don’t. That’s why some people inside businesses are Blamers. Whenever there’s a problem, or things didn’t do according to plan — they’re the ones who want to make it a priority to find out who’s at fault. They’re also the excuse makers and they can poison us, and the whole culture we’re trying to create. I’ve sat in far too many meetings where a Blamer tried to hijack the meeting to accomplish just one thing: find out who’s at fault. Wasting time that would be better spent solving the problem, or coming up with an improvement of a process, or anything else that would be more positive. Besides, we usually know the team members who didn’t perform well. Maybe they’re not to blame entirely, but they’re not helpful in moving us forward. During a crisis, or a time when we’re solving a problem – or trying to make an improvement – it’s probably not the ideal time to be distracted in finding people to blame. There’s always time for that later. I’m not fond of accessing people problems during such times because I want to make sure I’m doing the right thing, in the right way. Unless somebody has done something illegal, or violated a non-negotiable standard I’ve set (honesty issues, drug/alcohol issues, violence in the workplace, etc. ), I’m going to make personnel decisions at a more appropriate time. But all this score keeping thing is mostly about our own performance, not somebody else’s (including our team members). This score keeping is more personal, less an enterprise kind of thing. You need to keep score in your business. Whatever KPI’s you’ve established are the ones that likely serve you well. Maybe there are better ones, but the ones in place are serving you well or you wouldn’t have them in place. A subsets of those KPI’s are the ones that are personal to you – the ones you can affect. As the CEO you can affect all of them. If not directly, indirectly. We mostly buy into the belief, “Never let ’em see you sweat.” Vulnerability isn’t popularized in mass media. Certainly not when you’re the top leader of an enterprise. Instead, the jerk who operates like a maniac, driving people to mythical levels of achievement is made to be a hero. We like to make a correlation between the personality and the performance, but I just don’t buy it. There are too many good people leading good enterprises and creating value at every turn. CEOs can be driven by their fear to be jerks. The highest value is found in being human. People connect with real people. When the real person is at the top of the food chain, it’s even more powerful. If you don’t think so then let me introduce you to a man I’ve long admired, Jim Goodnight, CEO and founder of SAS. “Treat employees like they make a difference and they will.” That’s a Goodnight quote you can find on their company website. Goodnight isn’t that maniac on a mission who will step on anybody and everybody to get his way. He’s a real guy who understands that his employees have real passions, drives and desires – professionally and personally. He takes care of his people and they take great care of the business. The man has a solid grip on how powerful people are in helping build a great business. Goodnight keeps working. He’s been doing it successfully since he started the company in 1976. He’s had up’s and down’s just like you. And me. He’s won a bunch, and lost a few (maybe more than a few). But he’s an ideal example of a CEO and founder who just keeps on working. I don’t know him personally, but I can promise you he’s afraid of many things just like us. Running a multi-BILLION dollar business may elevate his fear to levels we don’t understand. He’s in touch with his own humanity – and vulnerability. That’s why he’s a great leader devoted to his employees. If you want to learn more just type his name in the search bar at YouTube and you’ll see some terrific interviews. Here’s the point of it all — CEOs may be among the most vulnerable people on planet to fall in love with a past win. Mostly, I think we’re an optimistic bunch. We focus on the possible. Our work involves solving problems that vex others. We thrive on the stress of knowing there’s a lot on the line. It’s what we do. It’s why we have the role. Don’t misunderstand the point of today’s show. It’s not an indictment of keeping score. It’s certainly not a show against celebrating victories. Frankly, too many of us don’t do that enough. We lean on our people to produce better results today after we refused to let them enjoy the win they produced yesterday. Big mistake! No, the point is that we need to live in the present and operate our business today. I hope you had great success yesterday. And I hope you led the parade for your people to celebrate it. But if you didn’t win yesterday I hope you don’t get distracted by that today. And I really hope you’re not cracking a whip today berating your people over it. Instead, I hope you’re using today to get the work done – better! It’s about doing the work. Well. Without fail. Without excuse. 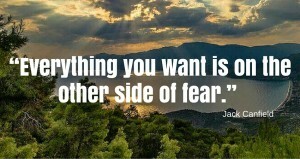 Without letting fear stop us. Or romance. Romance? Yep, you read it right. That’s where keeping score can really mess us up. We fall in love with our ideas and our successes. Sometimes our players. The opportunities today don’t much care about any of that though. Today’s challenges, issues and opportunities need our focus in this present moment. If we’re so locked into the scores we’ve accomplished in the past, then we’ll fail to maximize today. Ditto on our past failures. Whatever misses make up our past have no bearing on today, unless we let them. It’s not merely head noise. It’s focus and a way of thinking. We get stuck in a paradigm. We don’t stretch the possibilities. Sometimes because we don’t know how. We fool ourselves into thinking that what once worked will still work. And what didn’t work the first time, will never work. That’s not necessarily true. But if we believe it, then it may as well be true. A major hurdle of doing the work – well – is to be willing to change our beliefs. That requires an openness, vulnerability, honesty and willingness that only the rarest CEOs have. This is why I do the work I do. It’s the driving force behind my service to CEOs, business owners and other top executives. I know it’s not for everybody. Not everybody understands it. Or believes in it. That’s fine. Extraordinary means not ordinary. If it was for everybody, then it wouldn’t likely have the value or remarkability that it does. 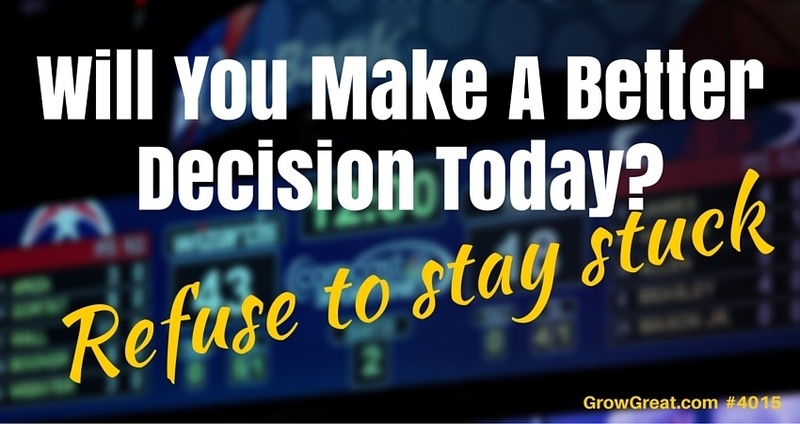 Your leadership hinges on making the best decisions possible today. That’s the name of the game for every CEO. You can fly alone and gut it out, or you can get unstuck and find heights you never thought possible. Lately I’ve been seeing some geese fly over my house. Small groups of them flying in a formation. Because they know today’s distance is determined by going together. CEOs can be stuck working by themselves, or they can embrace a novel – but powerful – practice of joining forces with other CEOs in small, intimate groups and having a coach lead the way. So I’ll end with challenging you to consider breaking free. Maybe it’s a good fit for you. Maybe not. Just give yourself a chance to find what suits and bests serves you…because the work continues. It depends on you and your leadership.